Hi everyone and I hope your week is going on well. The days are going by so fast and my baby will be 4 months old tomorrow -- time flies :) Hubby and I are excited about our Christmas plans with him. The weather has been changing; one moment, it is raining and the next, it is sunny, warm or breezy. When breezy, it is cold which means fall is definitely on its way. I have started digging out my fall sweaters. 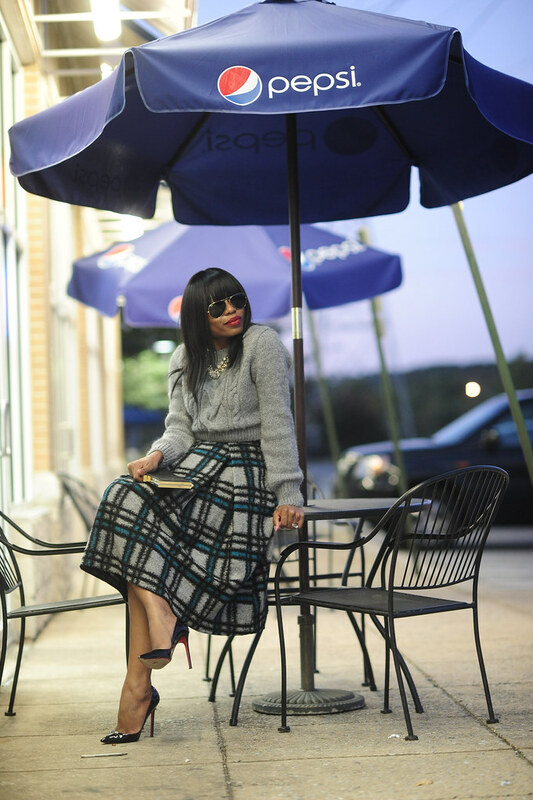 For this post, I found my chunky grey H&M sweater...perfect to pair with the plaid full skirt. I love the lady-like feeling of full skirts. Also, I love the fact that full skirts can be styled in different ways to accommodate the changing weather. The grey sweater compliments the grey details of the skirt and showcases the print of the skirt...making the skirt the statement piece. Talk to you soon...Have wonderful day! Your skirt is TDF! Gorgeous look and adoring your Louboutins! You just wait. The next thing you know, he'll be about to turn 13, like my oldest son tomorrow. Or losing his two front teeth, like my younger son. Or telling you she can brush his hair HIMSELF like my daughter. LOL Aw they grow up way too quickly. I love your sweater with this plaid skirt so much! Very ladylike and modern with a vintage twist! Just discovered your blog, I have a skirt very similar to it, and I did an outfit on it, I just have not posted yet. Love your way of styling it, will def. take note. i am loving the whole outfit. how cant believe how good you look already. Can you do a post about how you got back in shape so quick. you look amazing. OMG Stella; I adore this outfit!!! LOVE it so much; been loving the full skirts trend and you pull it off so good. hey stella you look great, now that you have had a baby i want to see more variety in your post like how you manage to balance motherhood and a job, how you are getting back in shapes. tips on motherhood and baby. i appreciate the outfit post just looking for more now. I love this look!! So feminine and lady-like! Looking good mama- Love your skirt!!! Full skirts really do suit you and I love that you teamed it will a knit jumper (sweater) for winter. Lots of love from the UK. Aww,Joys of motherhood! i love the whole look, the skirt is beautiful! Pepsi should pay you!!! You look fab! the BEST I've seen plaid styled yet!!!! That skirt looks amazing on you, love it!!! I have to get on board with this trend. Plz check out my fashion blog at www.fashion1psychology.com Thx! Amazing Stella. You wear it well. I totally love it. Stella, your style is absolutely impeccable. I've never seen a bad outfit! What was the occasion for this outfit? Is this something you would wear to work? I'm looking for ideas for my corporate uniform once I return to work. Happy four months to your beautiful boy!!! omg!! this look is fantastic!!!! you just convinced me to buy this skirt! @Josie: Thanks dear. Depending on your job environment, you can wear it to work. I wore it to work and I have also worn it differently to church and event. You look incredible. I'm in love with this look. I want your skirt! You are just too classy.